A warm welcome to my website. I want to take some time to introduce myself to you. I am general family dentist with a great interest in cosmetic dentistry. I always take time to listen to what my patients have to say. This helps me deliver the highest level of care. I like to take the time to present all the treatment options and discuss and questions you may have. I enjoy treating adults and children with my relaxed and informal approach. I like to put my patients at ease before I start any treatment and will do whatever I can to make you feel comfortable. I graduated from the renowned Bart’s and The London school of Medicine and Dentistry in 2004. I completed my Vocational Training year in Peterborough and won the communication skills prize for my class. I then returned home to Essex to start practicing general dentistry. I very quickly moved into private practice and wanted to improve my skills accordingly. I took my diploma exams and was the awarded MJDF from the prestigious Royal College of Surgeons in London. I got such a great feeling from studying for a course, passing my exams and using my new skills to help patients. I then started a journey of self-investing and doing all the courses I could to be able to deliver the best care I can to my patients. Amongst many courses, I have completed the prestigious Christopher Orr years certificate for Cosmetic and Restorative dentistry. I have also recently passed my exams for Primary Care Oral Surgery at The Royal College of Surgeons in London. I have been lucky enough to learn the art of cosmetic smile design from the Extreme Makeover (tv show) dentists Rahul and Ash. I have been trained in Facial Aesthetics by the well known Dr Bob Khanna. I really enjoy spending time with my patients, getting to know them and listening to them to understand what they really need. 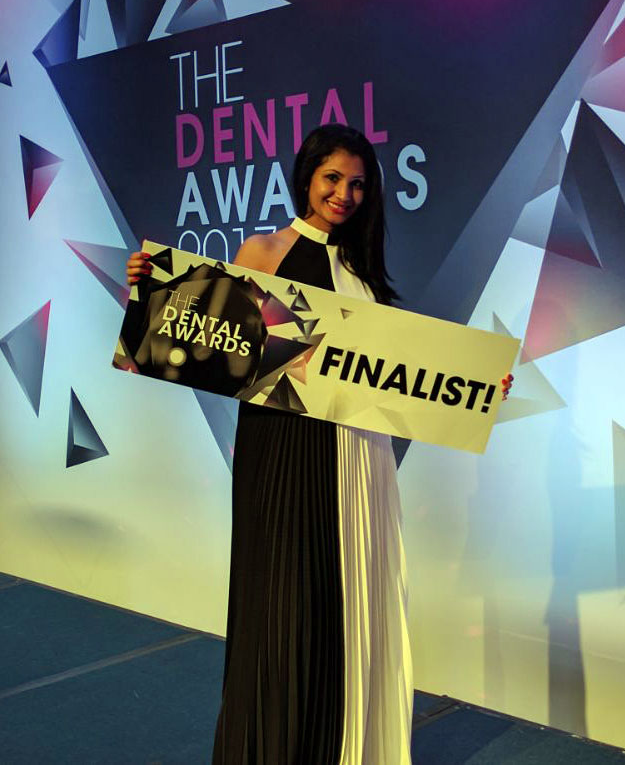 I have an absolute passion for dentistry and strive to reach a perfect result for each of my patients whether it be for facial treatment or dental. I have gained a reputation for treating nervous and phobic people due to my patient and gentle caring manner. I use many painless techniques to try and relax my patients and helped them be able to have treatment they may have not thought possible. I’ve been lucky enough to be awarded by FMC magazine as the highly commended dentist in London in 2016. I feel so privileged to have this award and to have been picked by a prestigious panel of judges. I like to give back and I am a Clinical Teacher at The Royal Hospital where I was once a dental student. I love teaching undergraduate dental students and helping them shape their futures. I remember very well how it felt to be in their shoes and always try and give them good practical advice. In my spare time I enjoy making full use of my Meerkat Movies and try to be up to date with the latest movies. I also love eating out and going to the gym. – BDA, British Dental Association. – BACD, British Academy of Cosmetic Dentists. – Member of Dental Defence Union . – Completed the Primary care Oral surgery certificate from Royal College of Surgeons. .
– Completed certificate stage of Orthodontic MSc at Warwick University. – 6 Month Braces Certified. – Completed the SAAD sedation course for nervous patients. – Skin needling and rejuvenation certified.